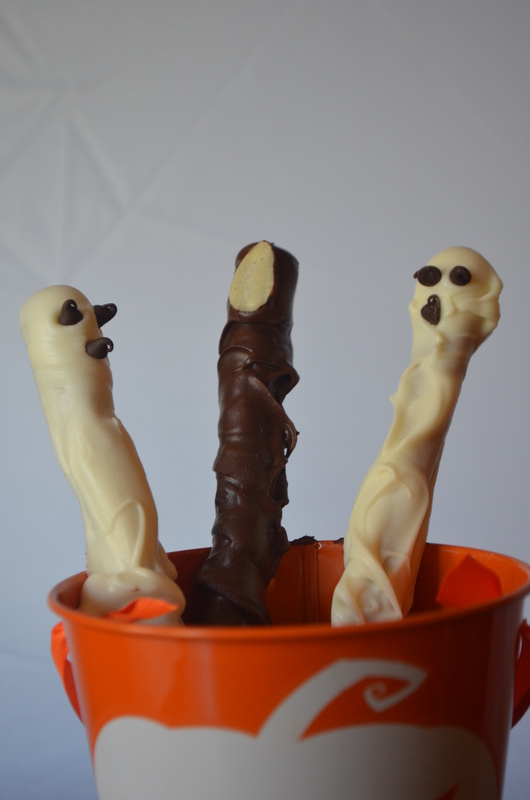 My Assorted Dipped Spooky Pretzels are a combination of pretzel rods dipped in chocolate with an almond sliver that makes it look like a finger, and pretzel ghosts dipped in almond bark with miniature chocolate chip eyes. 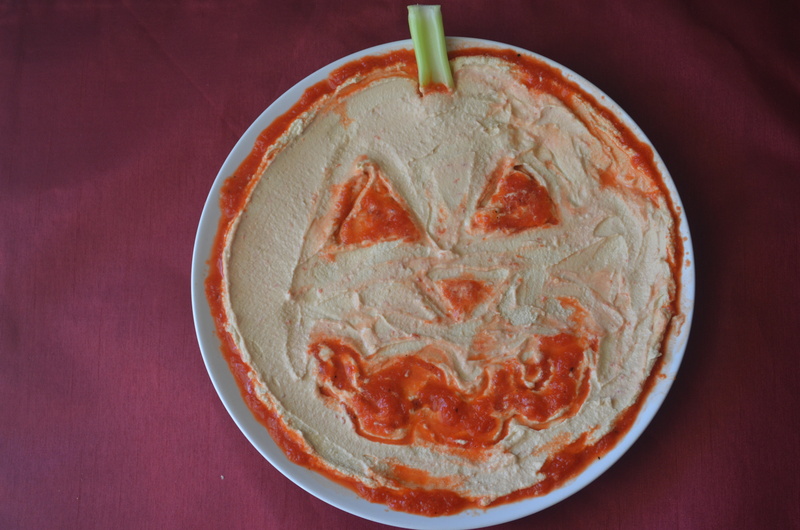 The great thing about Halloween is it’s the one time of year that if you mess up what you’re making it doesn’t matter because it can just look scary. For example, misplaced eyes on my pretzel sticks don’t look bad but that would be a completely different story if this was Christmas and those were snowmen. They’d look deranged. 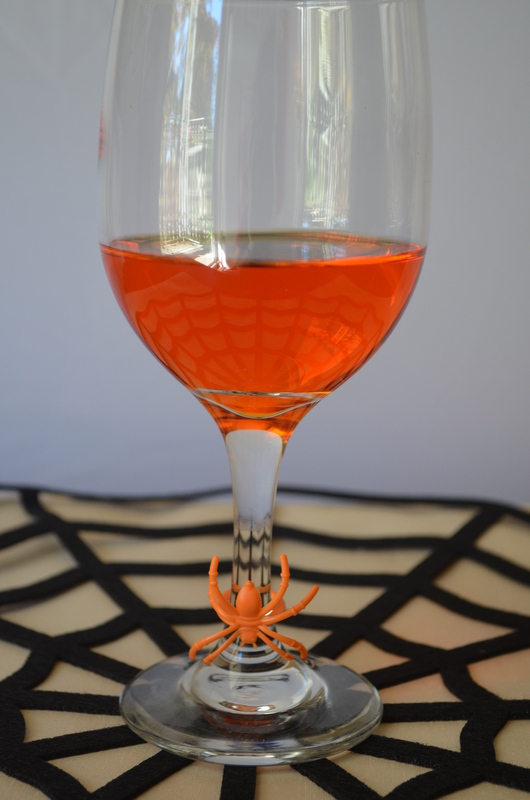 Christmas and Thanksgiving are about perfection but anything goes with Halloween, which is why I think I love it so much.
. I got the idea for the pretzel finger at a Halloween festival I was at last week. 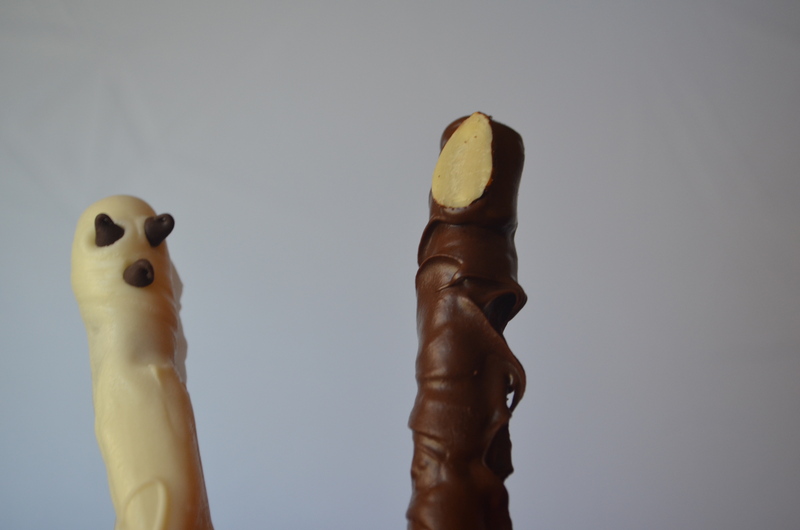 A vendor was selling those chocolate fingers and I thought it was a great idea to share. I have long made the bloody finger cookie for Halloween, so thought this was a nice change. Clean a work space and lay parchment paper out over a cookie sheet. For the almond bark: Melt it according to package directions (there are microwave and stovetop options but I used the microwave because it was the fastest). To keep the almond bark from getting hard, divide it in two batches and melt it in two batches and make one batch of dipped pretzels and then the other. When it has melted, dip 2/3 of a pretzel rod in the almond bark and swirl it around to coat it. Place it on parchment paper. Allow to cool 5 minutes and then add mini chocolate chips for the eyes, if using chocolate chips. If you are using icing instead, allow the almond bark to cool completely before drawing the eyes and mouth on with icing. For the chocolate dipped pretzels, place chocolate in a coffee mug and microwave 30 seconds at a time, stirring between intervals, until the chocolate is melted and smooth. 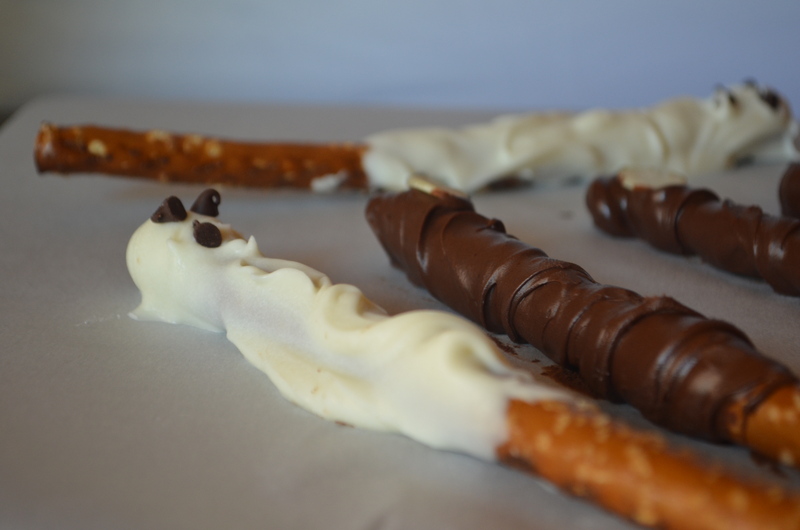 When it is smooth, dip the pretzel rod in the chocolate and swirl it around to coat 2/3 of it (a spoon helps with this process). Place it on parchment paper and carefully add an almond sliver at the top to look like a finger nail. Cool completely before serving (1-2 hours). This entry was posted in Desserts and tagged almond bark, chocolate, dessert, Entertaining, fingers, fun, Halloween, kids, Party, pretzels on October 25, 2015 by Juliana Goodwin. It’s summer … Let’s throw a margarita party! Nothing livens up a hot summer day like a margarita party. Margarita parties are one of my favorite, laid-back summer rituals. Now, if you don’t entertain very often because you think it’s too much work, then the margarita party is for you. This is simple, fun entertaining (and women tend to particularly enjoy these). The idea behind it is to provide a variety of margaritas for guests to sample and finger food, so you have plenty of time to visit with friends. It’s a blast. 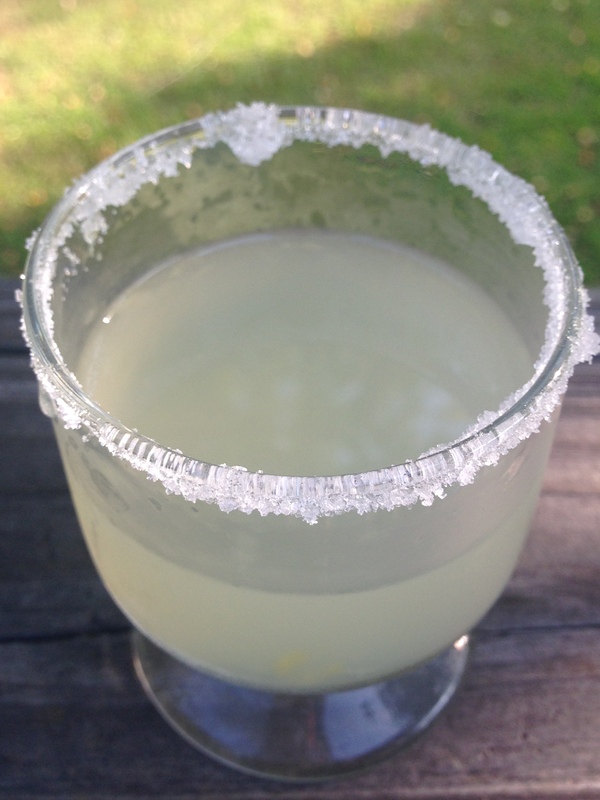 I make a wonderful basic margarita and it’s not overly acidic. I love margaritas but find that so many recipes (especially ones that use sour mix), make my stomach hurt after one drink. What’s my secret? 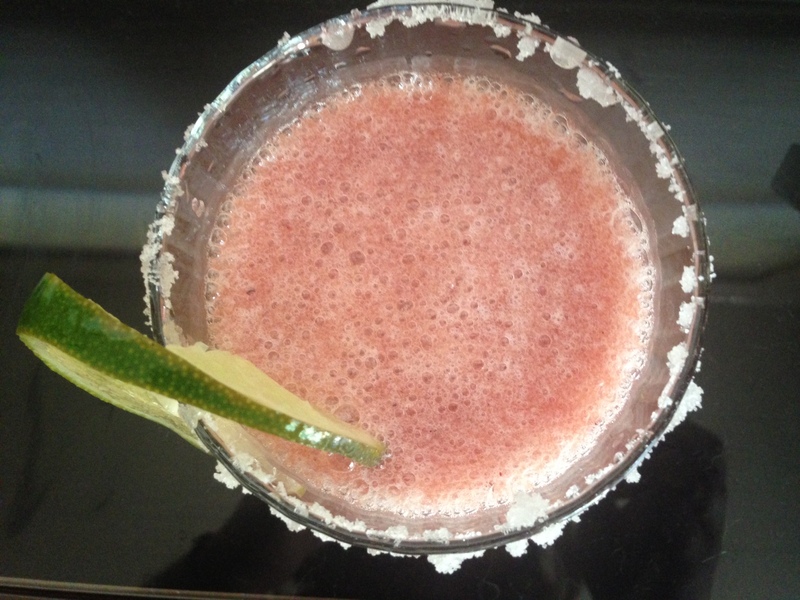 I use frozen limeade and fresh lime juice in my classic margarita which makes it smooth and less acidic. When throwing a margarita party, I always offer a pitcher of plain margaritas and then put out some liqueurs that people can use to add a shot to the classic margarita. For example, for an Italian margarita, add a shot of amaretto (that one is a little too sweet for me). For a top shelf margarita, add a splash of Grand Marnier (that’s my favorite). A shot of brandy is surprisingly good in a margarita. Add a hint of raspberry with a shot of Chambord or another raspberry flavored liqueur. Curacoa will add a hint of orange flavor and turn your margarita blue (it’s very pretty). If you don’t have a well-stocked bar, then buy a few airplane size bottles of liqueurs for guests to experiment with. If you don’t want to add the extra cost of the liqueurs, simply make all the margarita recipes here (I have three) and you will have plenty of samples for guests. I like to offer garnishes of lime and orange slices and then both coarse salt and sugar for guests to rim their glasses. You can buy specialty margarita salt or just serve coarse sea salt. 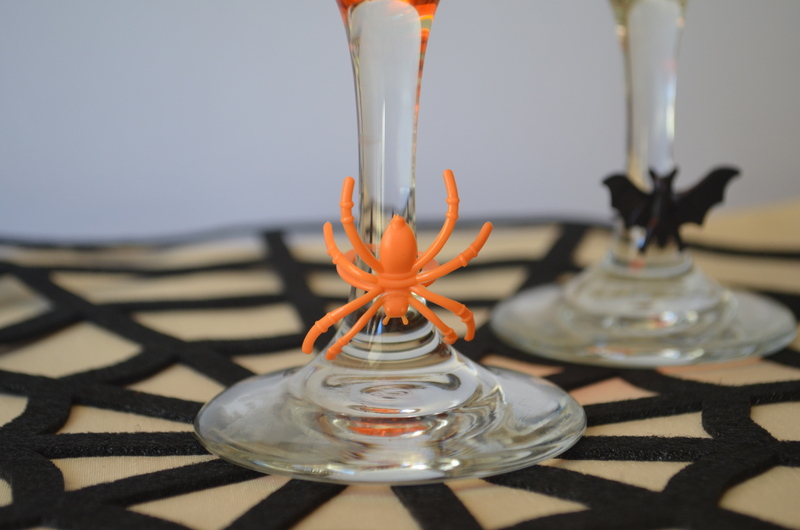 A drop of food dye can color your salt or sugar and make it more festive. Aside from the classic margaritas, I always have a pitcher of flavored margaritas, usually frozen cranberry margaritas. 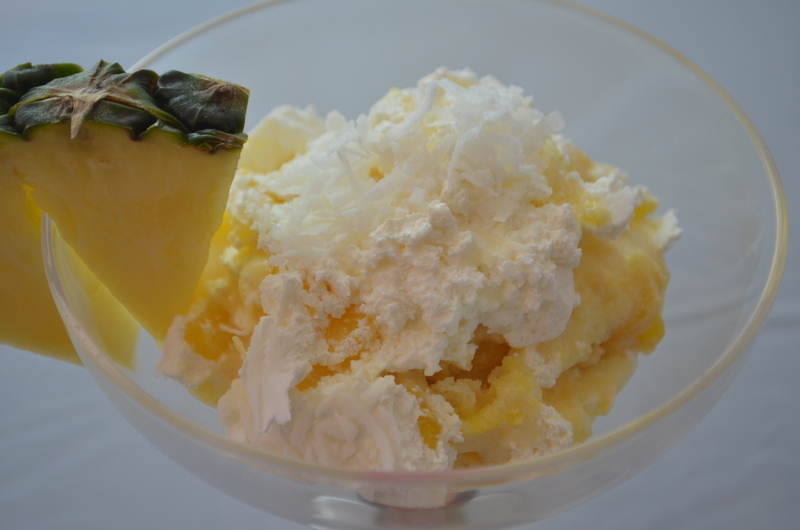 My mother got this recipe years ago from her cousin Jane Hightower and it has been a huge hit in our family. It’s wildly popular when I serve it at parties because it’s a great balance of sweet and tart. It’s also a frozen margarita which is particularly welcoming on a hot day. It also makes a large batch. 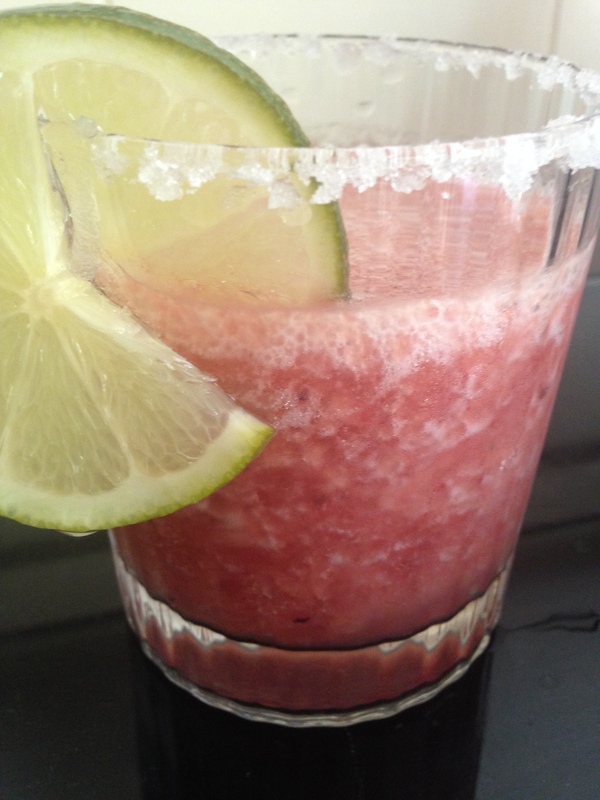 For this column, I also whipped up a blueberry margarita too, which is delicious but sweeter than a classic margarita. My mother-in-law loved this recipe. There’s only four ingredients so it’s pretty easy to make and uses natural juice (again, less acidic). This makes a small batch, enough for three regular margaritas or six samples. Another flavored option is mango margaritas. To make a batch, simply make your favorite pitcher of classic margaritas (if you’re making mine, omit the orange and orange liqueur), then add ¾ of a pint of mango sorbet and stir until it’s melted. This makes a fairly sweet margarita, but it’s delicious and refreshing. Serve it over ice. 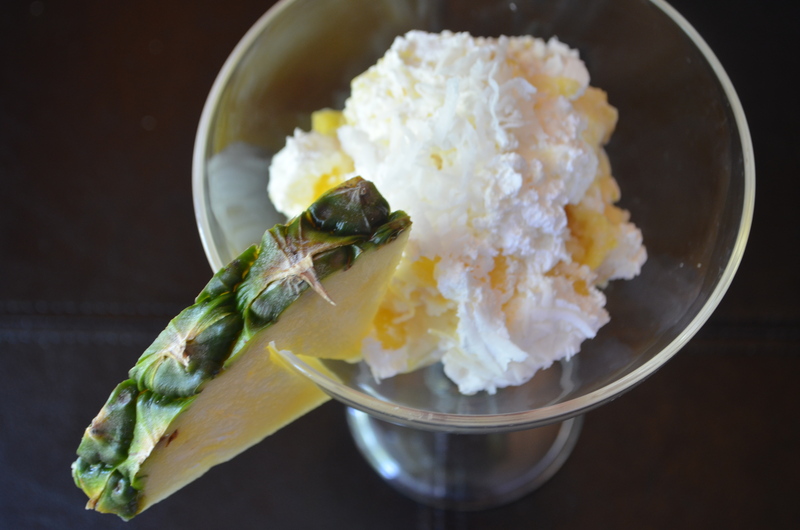 A twist on this idea to make margarita floats and serve a class margarita with a float of frozen sorbet (mango and raspberry are best) and let guest eat the sorbet out of the drink (like a root beer float). As you can see, you’re only limited by your imagination that’s part of the reason I love these parties; I come up with something new every time. 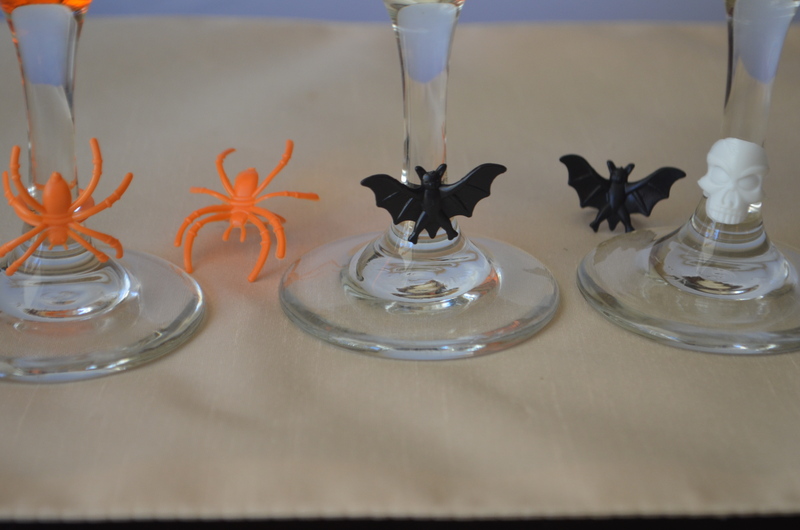 Since you will be serving several options of drinks, I suggest using smaller glasses, like juice glasses or even dessert cups so people can sample without drinking too much. The great thing about this party is you can make all the margaritas in advance and pop the pitchers in the refrigerator so you don’t have to stop to make more drinks. Also, don’t forget to have buckets of ice for drinks. As for the food, I keep it simple. I am a big believer that variety is the spice of life and so I offer three or four different flavored salsas, like classic, chipotle, black bean, peach or pineapple. I always throw in a fruit salsa. I have made salsa for these parties and bought it, too. I like to serve some salsas in margarita glasses to add height to the table setting. Walmart sells giant margarita glasses you can use to serve dips or chips. A dollar store is a good place to buy margarita glasses if you don’t have any; TJ Maxx also tends to have an affordable selection. Pier 1 has beautiful glasses if you’re budget isn’t too tight. As for the tequila, you can use silver or gold but I prefer gold because it’s been aged in barrels so it tends to be smoother. Other than that, all you need for the perfect party is to invite your friends and enjoy a summer day. Have fun. In a large pitcher, stir together limeade, water, lime juice, Grand Marnier, tequila and juice the orange and add it to the mix. Slice up a lime and use it to garnish drinks or float a few slices in the pitcher. Keep refrigerated until serving. Serve over ice. Stir together juice, tequila, lime juice and orange liqueur. 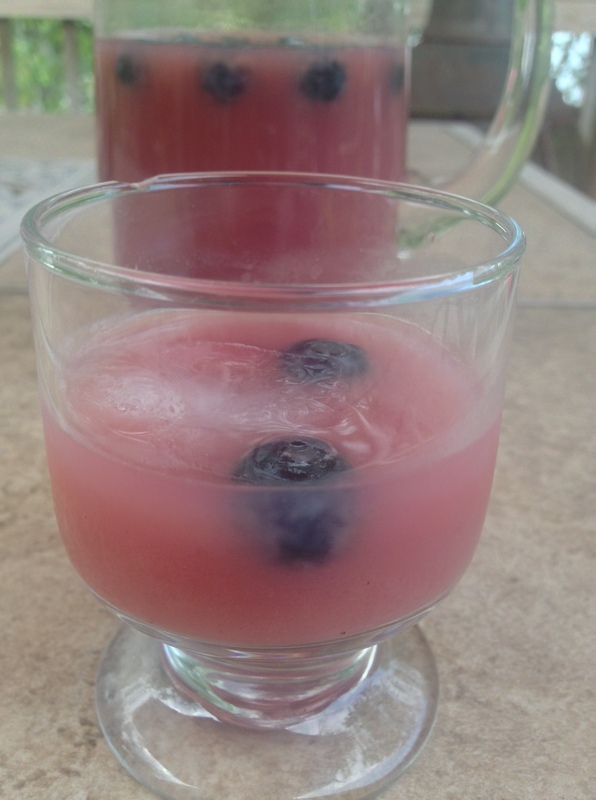 Serve over ice and top with fresh blueberries. This makes a large batch, so you have to split it into two batches in the blender. Add half the ingredients to a blender and blend until smooth. Then transfer that to a large pitcher. Repeat and transfer the other half to a large pitcher. Stir and serve immediately. 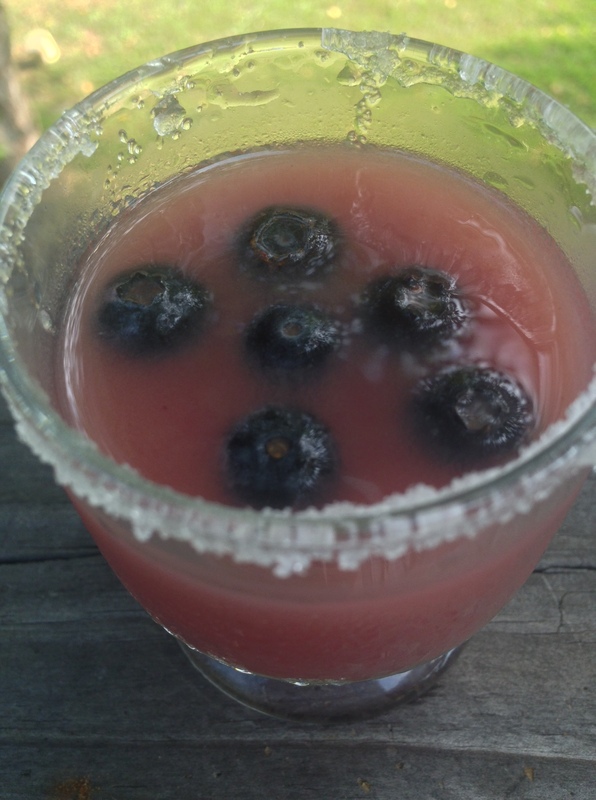 This entry was posted in Drinks and tagged blueberry, cranberry, easy, Entertaining, fun, hot, lime, margarita, Party, refreshing, soiree, summer, tequila, women on June 10, 2015 by Juliana Goodwin.